ŠKODA is already known for its ability to build fantastically strong, safe and reliable cars. But now, following three-years of planning, development and testing, ŠKODA has added to its award-winning range with the addition of a bullet and blast-resistant version of the Superb Estate. The armoured Superb is the end result of a joint venture project between ŠKODA and a UK-based convertor. Following three years of development is a finished model that is virtually indistinguishable from the standard production car yet offers bullet and blast protection to occupants. Protection is provided by a combination of bullet-resistant glass, high strength steel and composite materials; yet despite this the fully armoured Superb retains its spacious five-seater layout cabin, large boot and acclaimed build quality. 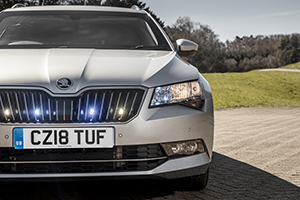 The final on-the-road cost of an armoured Superb is £118,688, and, like all new ŠKODAs, comes with a three-year warranty as standard.